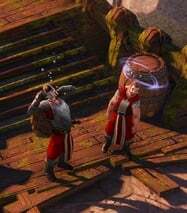 Guards At The Bridge is a Side Quest in Divinity: Original Sin Enhanced Edition. This quest is started when you come across 2 Drunk Guards past the tutorial dungeon/fight. As you make your way to Cyseal after the first tutorial fight / dungeon, you will come across 2 Drunken Guards guarding a bridge. They will explain that they are hunting for Orcs. Your characters will engage in a dialogue among themselves if you kill them. You will get either +1 Heartless or +1 Compassionate based on your choice.